Partial curfews can really put a damper on any celebration. Most recently they calmed down some celebrations for St. Patrick’s Day. We’ll go over both sides of the equation as far as running a bar and from a design standpoint as well. This is a complicated, multi-faceted topic that you might not realize quite a way but should understand by the end of this article. It’s not as bad as you might think in most cases as well. You can pretty well work around it. One reason partial curfews are put up is political pressure. Many of those in a community have some say in what lawmakers do; at least local ones. Therefore this is just one of many restrictions which you may run into as a bar owner. Unless you can apply serious pressure in the political realm then there is little that you can do about any of this. It’s just one of the many small annoyances which you probably already deal with. Patio Furniture needs a break too and you can look at it that way. After a rowdy party it’s probably going to be in pretty bad shape. You might try explaining to customers that you need to clean up. It’ll work for some. You can also offer some discounts for future nights which will appease practically anyone. It gives your workers a break as well. There is a reason that many bar owners and workers dread the holidays in certain parts of any country. There are some good reasons for partial curfews like this. One is that many celebrations take place while nearby residents need to be at work the next day. Without proper sleep they could get in some serious trouble. On the side of officers there are many fights and other violent incidents when someone drinks all night. It’s just something that normally happens and they want to avoid it as much as possible. So it’s understandable why these would be around. Even after the celebration ends you can still help your patrons enjoy everything. Offer them some relaxing music inside or some calmer drinks to wind the night down. Many of them have their own jobs later on, after all. You can to a large extent control the tone and pace of any celebration and this is no different. Subtly encouraging customers to cool down a bit can work wonders. The best way to learn about how to deal with this is to learn how other bars work around it. Some of them in St. Paul explained everything well to customers and made sure to let them know they are just falling in line with local law. Making your customers feel like you are on their side is very important to. It can make the difference between them being fine and really angry with you. On the other hand the alternative is having a full curfew. When this happens you actually do have a problem so you should avoid that whenever possible. It is rare to see that though. Outdoor cruise bars are becoming much more popular in recent years. Every modern cruise ship has something like this, at least the ones made in the past few years. So why is this so popular? There are many factors that make it absolutely charming. While you may not have a cruise ship of your own you can bring a similar climate depending on where you live. Basically it’s all about the ideas which you can gather from looking at other bars. Many cruise ships feature Fire Pit Tables and other important perks. Having an extravagant setting seems to be the way to go with all of this. More is actually more in this case because people want to feel like there was a lot of effort put into the setting. Most patrons will really appreciate all of this if you can show them that you care and are working to make them happy. Natural light goes a long way into creating an interesting addition to your outdoor setting. In a cruise bar environment they pretty much have this constantly. If you have a different setting you should try to stream some of that into your setting. If you have more of it than you need then a few umbrellas can go a long way into keeping your guests from becoming uncomfortably hot or even sunburned in a few cases. You can even put it on a smaller boat. Having a comfortable indoor area is also quite valuable. All cruise ships have this by definition but you should have the same going on. If you have an uncomfortable area to drink in inside it can hurt the entire setting. Maintenance is important here as usual. So if your air happens to go out then get it fixed as quickly as you can. This is common sense for some but not everyone realizes just how important it is. While much of the evidence for the trend is anecdotal it does make sense. Going bigger than the competition and have more extravagant settings is something you have to do in some cities. New York, for example, is no place to go small considering the clientele there. Although there are some small sections with hole-in-the-wall settings they are becoming more difficult to keep around in some areas of the city. Something tropical and modern about these cruise ships also draws people in. On that note you should have a few drinks, and pieces of furniture, which draw this same sort of reaction from customers. Be sure to get their feedback on this. So how do you apply this to your own bar? If you live near a water feature it’s easy. You can bring much of the same furniture and décor to such a setting. If you actually own a sizeable boat there are many popular bars set on boats like those. So in either case it can be very easy to set this entire bar setting up. Just adding some chairs which allow you to lounge back can help create the sort of style which you are looking for. Tiki was recently featured as a major relaxation spot in Denver. In an area so filled with similar attractions you really have to stand out. 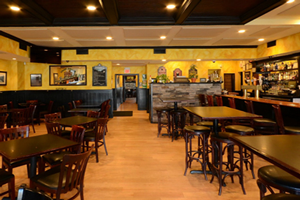 So we’ll be talking about this interesting spot to kick back with a flavorful drink. It also stands out because it’s a departure from the many similar bars around it since it goes for a refreshing style. There is much to be learned from that and some of you may already use it in your own hometown bar as well. So how do you create a small tropical paradise in a place like Denver? Given the natural environment it seems like a tall order. But honestly with the right drinks and atmosphere it can be done. As you might expect this setting does it perfectly by creating a friendly atmosphere with vibrant drinks. The furniture is extremely comfortable and helps you feel like you are really relaxing at a Hawaiian retreat. Many of you are familiar with the Tiki bar style but this place takes it to a new level. After all, it’s in their name. Of course they added Adrift to it for some style. Décor, food and drinks all come together in order to create what seems like an authentic Tiki lounge. Just, very far away from where you would usually expect to see them. 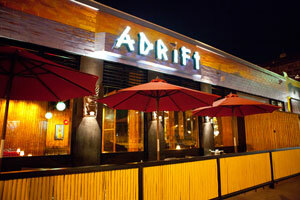 Lively colors and flavorful food create an atmosphere of energy and excitement for guests at this particular bar. The actual building also plays a large part in creating this mood. Walls appear to have treated bamboo on them and the lighting is always adjusted to give it the look of a sunset. Does your own building have a singular style that adds to the furniture? If the answer is no then you should probably look into improving the regular décor of the area. It could be the piece you are missing to make customers happy. In many ways it’s as good as authentic Tiki bars. Outdoor Furniture has the signature polish which is part of every other section as well. It’s not exactly going to put you into a tropical climate when you step outside but you can get some of the feeling. Mostly it is about relaxing though. This is something that practically any bar or business can use to their advantage. If you can help people relax then you have gone a long way towards making people really happy all the time. Food is a big part of their setting too. It’s not the traditional Denver fare but instead has many different dishes from the nearby Swing Thai. Having a partnership with another business in your area can be very useful. They can often provide you with additional work that you do not have to pay extra for. You won’t get the full funds you would for making it yourself, but both of you can benefit from this arrangement. Check to see if you have any suitable partners when you can. All of these reasons come together to stand out of the crowd in Denver. Perhaps you could break out from the crowd with your own designs in your area as well. 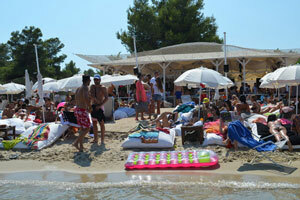 Beach bars will never go away and will always have a popular style. However some years they become more popular than others. Many writers are saying that this year they will be more popular than ever. We would have to agree for many reasons. Some of them you may have already guessed and others are a bit off the beaten path. We think they are valuable nonetheless. It’s a surprisingly complicated trend when you get beyond the initial layer so there is much to explore for designers. By far the biggest reason that people love these bars is the beach itself. The natural beauty and climate create a sort of natural outdoor furniture setting that you can’t simply create. You can however get it for free. So in some ways this sort of setting has a huge advantage over bars of all other types, as long as a tropical storm is not rolling into the area. Journalists are fairly excited about the trend as well. Although this happens every year it is worth studying for the atmosphere, and additional profits, the trend creates. It’s good for their local community in most cases and others just simply enjoy going to bars like this. As such anyone who owns such an establishment can expect some positive local press when that time of year rolls around and people want to party. You can also create this setting with a natural or artificial water setting as long as the nearby liquid is clean enough. Not all places are fit for this but it’s a great idea if you are near one. Umbrella selection is central in a sunny environment as well. Outdoor Furniture in this style needs to be extra-resilient. We’ve gone over this many times before but rowdy patrons will always appear here and there. While we hope you never have too much trouble with them it pays to be prepared during the biggest parties of the season. Otherwise you could end up with some chipped or broken items very easily. No one wants to have to replace these and patrons might not be thrilled at getting an extra bill. Music is a big part of any summer celebration so you should keep that in mind. While you can certainly enjoy the beach any time of year it’s obvious that summer is the peak time. Kids are out of school and adults want to enjoy the money they have worked for so long to get. It’s a pretty simple equation as to why we see such a huge upswing. So what do you do if your bar and outdoor furniture aren’t at the beach? You can always host event nights with specials and additional decorations. People usually love those no matter where you are in the world. It’s also fairly easy to find items for this as many big-box party retailors carry them. If you don’t already have some night like this at your establishment we suggest you look into it. If for no other reason than the fact that you can add some specialty drinks. Something really very strange is going on in an area of Columbia. A city ordinance is requiring all outdoor furniture from chairs to sunshades to be the same on each building. Limits are being placed on every piece. So why is this happening? What does it mean for design in the area? We’ll be going over that for you as well as a little history lesson on when this has happened in the past as well. While not something completely uncommon it always causes problems. For the moment it only applies to certain areas of the city but will spread throughout all of Cartagena. It’s being put forth behind the idea of beautifying certain areas of the city which have lagged behind in the past. Whether this will actually make a difference is quite unclear. It’s a copy of a similar plan that went through in the Plaza Flores of Murcia. Now everything looks pretty much the same in this area. Fortunately ordinances like these are not standard anywhere in the world. They come up here and there but are most often the result of some agreement between a politician and manufacturer. It’s usually revealed later much to the frustration and anger of those who have been victimized by this. While this isn’t always the case it usually is and therefore many problems like this arise when corruption is a factor of government. Of course all of this is just an educated guess from the other times in which we have seen this happen. 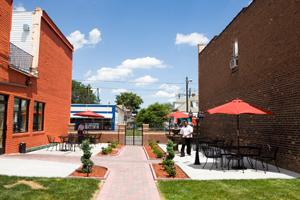 However these ordinances almost never come across simply due to city beautification. Laws on trash and overall upkeep of buildings serve that. So although corruption may not be a part of this there is something else going on making life much harder for outdoor furniture designers in the area. Other areas have nothing like this. It’s quite a problem because Brazil has long been known for their outdoor furniture. Having an amazing selection of wood is one big reason for this. They have some of the most physically impressive and resilient cuts of wood in the entire world due to nearby jungles. Many different people import pieces from famous designers to improve their own homes. It also allowed many different business owners to have an amazing look for tourists as well. The final result if this goes on of this will obviously be Outdoor Furniture that looks the same all over the area. It will also mean a large amount of money for the company this is all bought from. It can really make or break someone’s fortune in this case as well. So there are many people who have a clear vested interest in making sure the situation is resolved in one direction or another here. We believe that in time this restriction will be overturned when the entire story comes to light. What do you do if you have a similar ordnance? You should do whatever you can to fight against it. Designers and artists cannot flourish in such an environment. 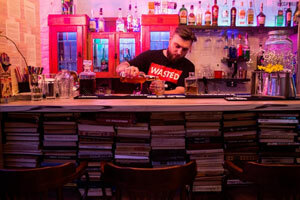 A hipster bar has become very popular in downtown Donetsk. Called Spletni the word means gossip in Russian. That is exactly what many visitors come to hear there in a very social atmosphere. So there are many lessons to be learned about branding and drawing groups. Due to this we’ll be studying the unique area of Kiev, Ukraine. It also gives us a look at a culture very different from many of those that we live in, unless some of our readers happen to be Russian. Sometimes appealing to specific groups is the way to go. This is often the case with bars. Culture is a big part of why we enjoy design. Furniture can actually invoke feelings in us if we believe it was picked out just for us and our friends. That is what they did at this particular bar. Are you able to invoke any sort of emotion in your own clientele? You probably already do and should capitalize on that if you at all possible. So it appeals to hipsters but in Russia that means something a bit different. It mostly refers to the growing middle class in a recovering country. Due to this their clientele is quite a bit more diverse than just pandering to a small subset of the culture. However instability has often led to this bar closing down due to a sheer lack of customers. So how did they handle it? By reopening of course. After a closure due to problems with separatists they reopened with a similar design to the original and many of their clients came back. So this is a word to bar owners worried about more than just furniture. Don’t give up on it even when times are really rough. If you keep the classic style and atmosphere in your design then you can expect to see many of the same people come back when times are better and you have a better location. Part of the reason this revival was so successful is that many those in the city felt that the bar was an essential part of the town. In many ways your design and service is not just a part of your unique style. It’s also a living part of a city and the memories of everyone who has had at least one good night at your bar are tied into this. On some level it is sort a spiritual feeling. Much more than just furniture. Other bars have this feel in a different way. 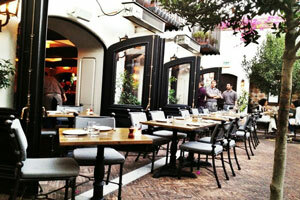 As always restaurant outdoor furniture here is not so different from other styles but has a certain atmosphere with it. It has a trendy, modern look that everyone wants to see on the exterior. Most of the action happens inside of course but this should be kept in mind. Do you have a certain look to your own business that draws people in? If you can create the atmosphere you want with one look then you’re probably well on your way to having one of the most amazing places in your city. AOC Wine Bar is one of the most famous indoor/outdoor bars in the entire world. So why this and what sets it apart? We’ll be discussing that for you so that you can take some of the same lessons for your own business. While you may not quite be able to reach that level you will at least be able to reach an entirely new sort of clientele. One which may have eluded you in the past. But is this right for your establishment and atmosphere? We’ll help you decide on that as well. The bar comes up constantly as “journalists” are always talking about a celebration there. So what sets it apart? First is the fact that you can buy incredibly expensive items there. Outdoor furniture and indoor table settings are exquisitely appointed. Huge amounts of money were spent on this in order to create a feeling that you are in a place which cannot be replicated without spending a similar amount of money. Wine is of course a big part of this since they have vintages that run thousands of dollars. One big part of this is the location. Los Angeles is a mecca for celebrities just, period. You won’t be able to replicate this unless you are in a similar big city like New York. IN that way there is of course an element that you cannot reproduce. So you may want to move there if you are actually looking to draw in some of the most famous people in the world. We don’t expect most readers to be shooting for that though. But is this right for you? In many cases we would have to say it is not. Those who have a down-home and casual feel will not have this work for them. In fact it could actually drive people away if you decide to go with this. Creating an air of elitism is something that many people would like to avoid. In cases like these even a bit of wear might be good for the furniture. It could give it that used look people enjoy. Naturally cool settings don’t hurt either. 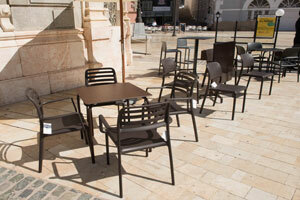 No expense is spared on outdoor patio furniture or any other item so the care for each setting is vital as well. We’ve talked about this before but no matter how much you spend if you do not take care of your setting it will easily wear out. It’ll gain a used look that drives off those who come there for the latest trends and most amazing seating arrangements. This is fine if you are going for a casual look but can ruin an upscale experience in moments. Celebrities also have a magnetic impact on each other and the wealthy. Many people go to places like this just so they are noticed by journalists and made famous. Today it is easier than ever to get your 15 minutes of fame. You don’t even have to be talented to do so. You just have to have the money and notoriety to do this. Many experts and authors agree that portable is the way to go for your outdoor bar furniture and items in general. Today we are seeing every sort of installation become portable. Whether it folds up or disassembles you can find something that fits into this area. Not only do these look great now but they’re also incredibly useful for reasons which should be blatantly obvious. In the past though these had been plagued by poor construction and other problems. Things have changed since then. Incredible improvements in both the nature and weight of manufacturing materials are responsible for this. We can now create things like chairs that fold into tiny briefcase-style attachments. Pieces can be placed within other ones due to the marvels of modern manufacturing. It’s quite amazing what we can do and there are even telescoping items that actively fold out of other ones in order to create an absolutely amazing display simply from setting them up. Most authors are at least mentioning this trend in larger articles. It’s a part of many other settings such as mixing the vintage and modern in order to create a contrast. While there will never be just one trend in a year it’s important to take note of the most significant ones. It simply makes sense to take all of these into account so you can make your own informed style predictions about what will work in upcoming years as well. Most of these are waterproof which allows them to be used as outdoor furniture and indoor as well. It’s also quite handy if you expect some of your patrons to spill drinks on them. No damage will be done to these of course. So that is something to keep in mind when you are looking for a utility-focused sort of furniture that you can use over many years. We had covered this a bit before but it is worth mentioning for 2015. Appearance is of course very important when it comes to these. Most of them area as impressive as traditional pieces of outdoor furniture. Many of them have a sleek sheen that looks amazing in the sun. Therefore you should not worry too much about that. In the past there were many very cheap items in this sort of portable setup but those days have passed from quality retailers. You have a huge selection of these to choose from at all times. Many items from chairs to outdoor dining tables are expected to benefit from this. What makes things interesting is we are seeing items that you would not normally expect in this as well. Such as fire pit tables which have all the style of larger ones but can be moved around normally. This is an impressive way to improve things for many guests. It can be useful for putting on a show as well since everyone likes to see things fold out and such. The only downside is that you will likely spend a bit more on this than you would with other items. If you are buying on a budget then go some other route with this. So how do you actually get everything in order from the very start? With the huge number of licenses, permits and contractors needed to complete any project like this it can be a real pain. So today we’ll be discussing how you would go about developing your own outdoor bar. Much more than just choosing bar furniture you need to know all the various aspects and regulations in place to insure that people do not serve alcohol in the wrong areas or break tax laws. In this case a performing arts center will be adding a bar. It will need a decent amount of construction and probably some additional licenses, although we would wager they already have liquor licenses. So it just comes down to the other factors. In their case it will probably be much easier than if they were doing this for a normal business. Because it’s basically a government institution so approval will likely be much easier. Your first obstacle is approval of zoning and construction licenses. Any number of factors can lead to your request being denied. Even another nearby business may complain about the drinks or the volume of your outdoor bar. All of these factors can become more significant if they have any sort of sway with the leadership of the city as well. It can become a very complicated situation for you and for all of those involved if someone dislikes your setting. Choosing a proper construction company or contractor is important no matter what type of establishment you have. Even private builders need to make sure that they have a great team for the project as well. So look over many different applications before you decide to go with one over the other. It’s the only way to make sure you are not burned during that starting portion of the event. Of course contemporary outdoor furniture is a must for this sort of project. Unless you are going for a speakeasy or western style it helps everything look clean and up-to-date when you actually do decide to open the doors up and let people into the area. Make sure it fits with some theme you have for the overall area. In this case, with the Lincoln Center addition, they will probably go with an upper-class modern art theme. It just fits with everything else. In this case they also have to be careful because the establishment will be set up near a small park. Not damaging the surrounding area is very important because everyone wants to respect green, organic design. Will your own project displace any woodlands or animals there? Consider that before you go to all the trouble of this. Most home projects don’t have to worry about this but a few do. A board may also have to vote on whether to allow you to set all this up. This probably doesn’t apply unless you are running a business but it is something to think about. Keep in mind that even if one person likes you the rest may not. The process may also take place over several months, which could be very troublesome for a few people. Irish pub style has always been a classic choice both for UK and American bars. It has even spread out to smaller areas all over the world. Having a place to drink with a kind atmosphere is something anyone can appreciate. A bit of comfort food makes it even better for most people. Today we’ll be looking at a very popular place in this style, the Kilkenny House Restaurant and Pub. As you might expect they combine all the best aspects of this type of establishment into one cozy nook. Despite being damaged severely in a hurricane the bar returned to service just a few weeks later. Firefighters worked nonstop in order to save the establishment. This is the sort of good will that a local business inspires when they create the right atmosphere. You cannot pay for people to treat you that well but you can get it for free if you manage to give them some amazing memories of your bar. Another big part of the positive atmosphere is that they’ll serve anything the patron’s want. They serve traditional Irish brews and dishes. But they’ll also bring out curry for guests who want it and spice up the menu in order to keep everyone happy to the same degree. So being flexible with your food and drinks does matter. 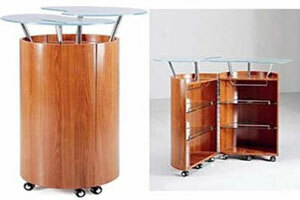 The same can be said for your bar furniture as well. If you have the space you may even want to have different rooms as well. Being featured as one of the best bars in an area takes something extra. People have to really love hanging out and eating with you in order to get that special appeal. Or you can spend some extra money on the publicity but who wants to do that? Practically no one in this day and age. So we would suggest working on your charm first. Their style does not have to be yours though. In fact that might actually be a bad idea. Finding your own way in an area of the city is something important that all business owners need to do. The same could be said if you are just running a small business on the side of your home. Only those with incredibly huge amounts of money to burn can actually afford to spend the money needed in order to copy others and succeed. Having a nice staff to go with vintage outdoor bar furniture is a big part of the puzzle as well. It’s what separates a pub from a dive. They go a long way towards creating the atmosphere you want.